M.2 solid state drives are normally used in laptops, but they’re also small enough that you can also use them as really incredibly fast and spacious USB drives. Most USB drives use slower eMMC memory, so moving to a proper SSD provides a big step up in terms of transfer and access speeds. 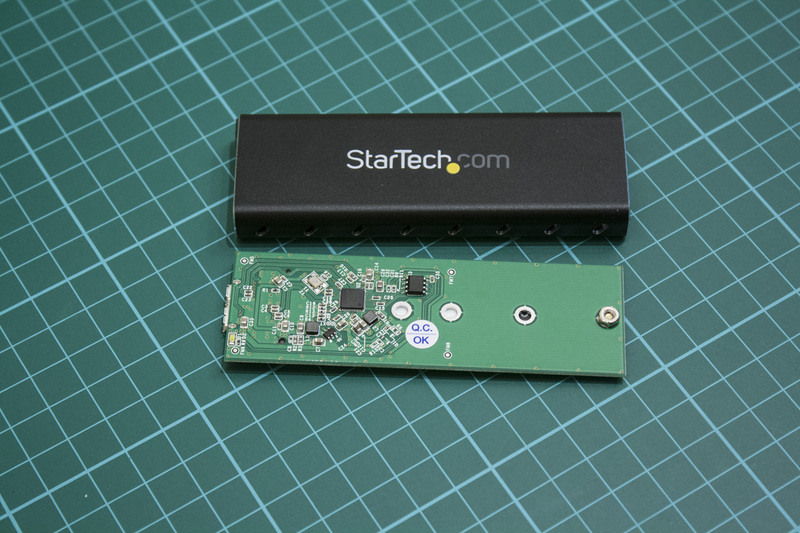 Startech.com have produced a M.2 enclosure, letting you take an M.2 SSD on the go. Let’s see how well it works! 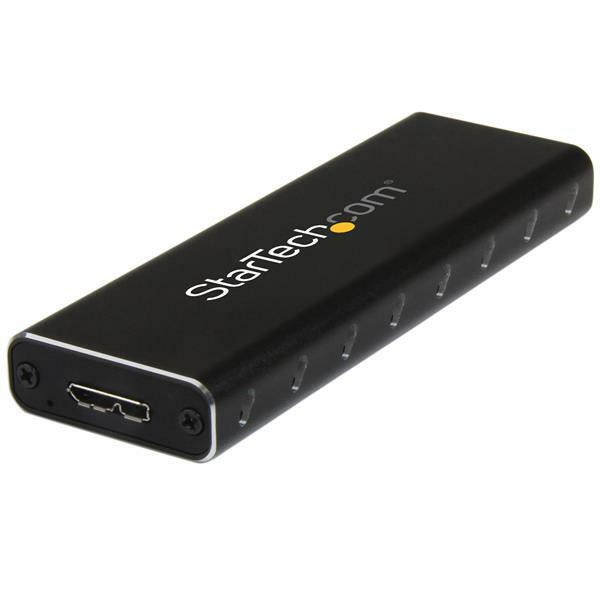 The enclosure has a pretty straightforward design; essentially a black aluminium tube, blank on one side and with the StarTech.com logo on the other. 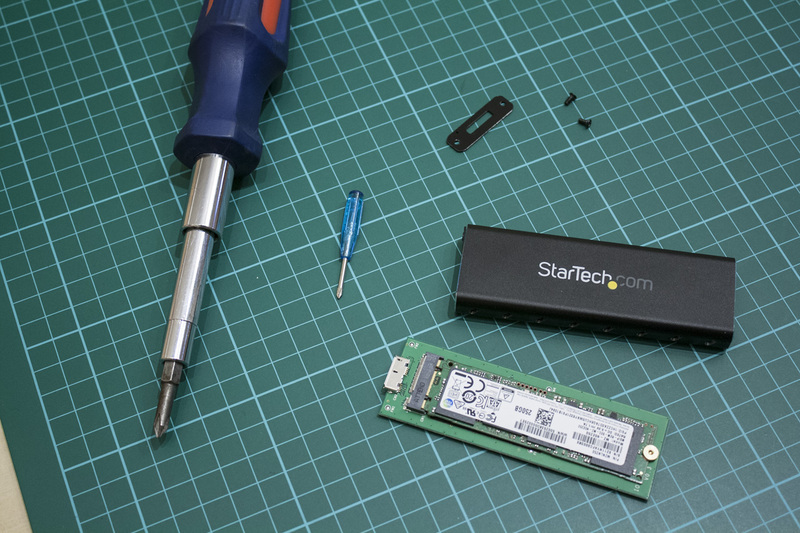 On on end we have the USB 3.0 port, and a pair of screws to insert your M.2 SSD (which is not included). It’s worth noting that the enclosure requires the cable to operate, unlike most USB flash drives which have a USB tip. This means it’s a bit easier to plug the enclosure into crowded USB ports, but it also means you have to keep a USB 3.0 cable with you to use it. Let’s get to the fun part – installing a drive and then seeing how fast it goes. This of course depends on the drive we put inside, so we’ll be using Samsung’s recent M.2 850 Evo drive. OK, so installation. We have to take off that grille by unscrewing the tiny screws. I found the built-in screwdriver quite bad, so I used a (slightly larger) one of my own to do the job, eventually. 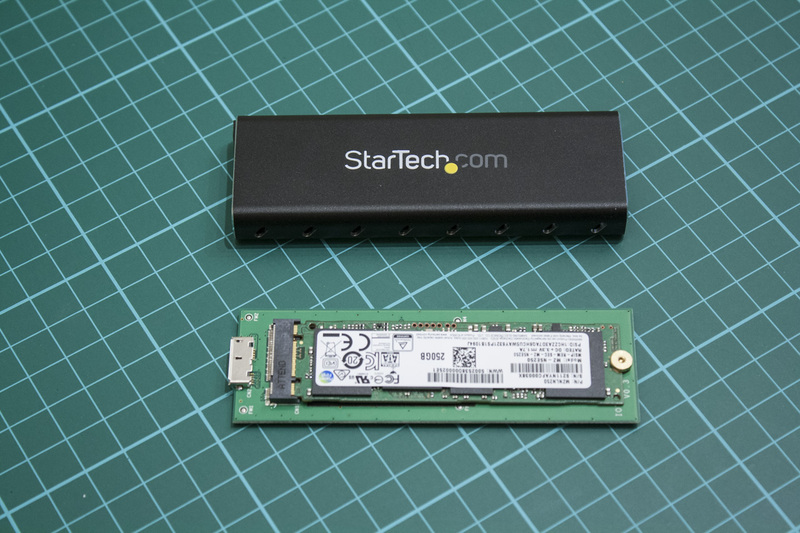 OK, now it’s time to mount your M.2 SSD on the enclosure board. There are a couple of different holes to accommodate different-sized M.2 SSDs; we’re using the largest size. The drive slides into the M.2 port, then is secured with the screw and nut. This felt really fiddly to me, and didn’t seem to be too well secured once finished. Still, once installed into the enclosure there’s no real opportunity for it to go anywhere. OK, so we’ve got the drive mounted now. Now, it’s just a case of sliding it back into the enclosure, and doing up the screws once again. OK, we’re good. Let’s move onto some performance testing – using benchmarks and a a couple of real world tests too. It took almost exactly 2 minutes to transfer 27.2 GB of large video files, at an average rate of 230 MB/s. Copying back was faster, taking just 1 minute and 40 seconds to copy the same amount at an average rate of 270 MB/s. 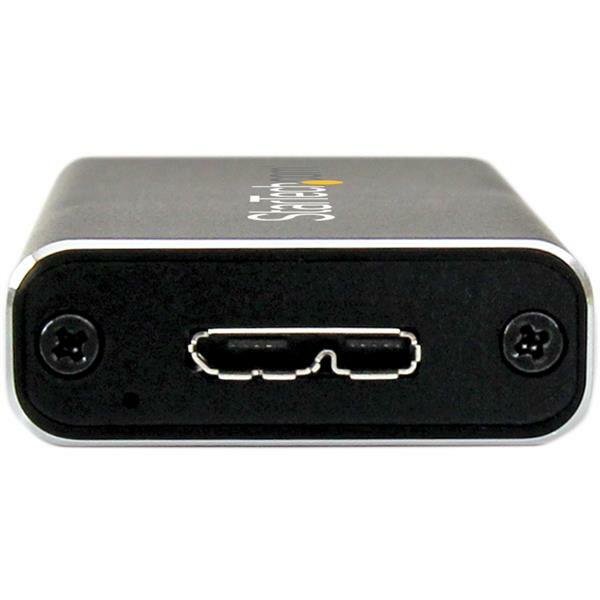 By comparison, a standard USB 2.0 flash drive copies similar material at a speed of around 15 MB/s, while a standard USB 3.0 drive is around 40 MB/s – a fraction of the speed. 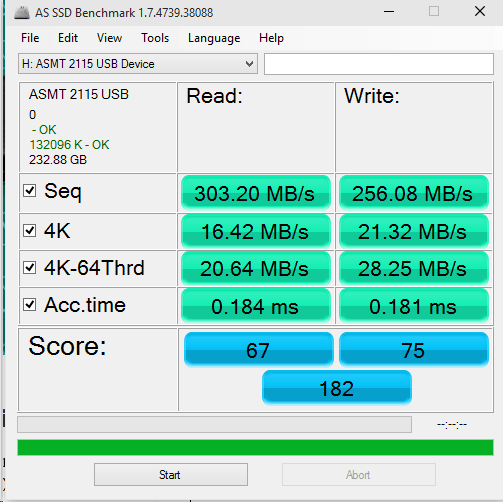 A good internal SSD, by comparison, can hit 400-500+ MB/s. CrystalDiskMark has been one of my favourite benchmarks for evaluating storage speeds for a while now, thanks to its varied incompressible workload and extremely readable results. Here’s the 3.0.3 x64 version of the benchmark; all results are in MB/s. We see strong results here, besting the 300 MB/s barrier for sequential and 512K reads, and the 270 MB/s mark for their respective writes. This is about 60% of the speed of the full-size version of the Samsung 850 Evo. AS SSD is another benchmarking tool quite similar to CrystalDiskMark, which uses predominantly incompressible data across a range of workloads including sequential tests, random performance and access times. First three numbers are MB/s and access time is in ms. Speeds are a little behind what was shown on CDM, but it’s still a reasonable result. Interestingly, the access times are around 3x slower than the internal 850 Evo. We conclude with HD Tune Pro, a benchmark which produces three scores for average read speed, read access time, and burst read rate. The burst rate here is again about 60% that of the internal Samsung 850 Evo drive. Once again, it’s quite reasonable performance for a USB 3.0 drive! Here’s what I’ve learned: the Samsung 850 Evo makes for an expensive but incredibly fast portable drive. The StarTech.com enclosure did well here; after a slightly fiddly installation I had no complaints. The enclosure felt solid and kept the drive well-ventilated, allowing its performance to shine through. At £35, you can certainly get a reasonable amount for your money… but I still reckon they should have included a better screwdriver! Toshiba XG6 NVMe SSD review: is this 96-layer SSD better than the 970 Evo? Interesting. I don’t have the drive any more, so I can’t really test the difference between different cables. Still, thanks for your comment. still, almost two and a half years after, this post article is still useful.